This RocketPort EXPRESS 8-Port SMPTE Card has eight expansion ports and is able to support multiple SMPTE products allowing for custom solutions. The RocketPort EXPRESS 8-Port SMPTE offers easy driver configuration and DTE/DCE option on each port. Free troubleshooting tools in the event that you want to diagnose an issue: Hardware diagnostics, LCOM (Linux tool for testing serial ports), Comtrol Utility, which includes Test Terminal (WCOM2) for serial port-testing and Port Monitor for monitoring ports. The RocketPort SMPTE Card provides the added flexibility to set the appropriate ports with the DIP switch to DCE or DTE RS-422 serial communications. It is designed for standard and low-profile PCs and servers. 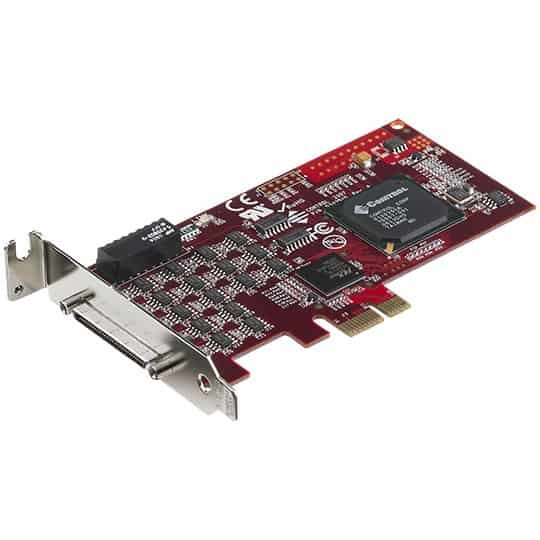 The RocketPort EXPRESS 8-Port SMPTE Card provides the equipment interface portion of an overall broadcast system, allowing interconnection of programmable and nonprogrammable control and accessory equipment. It allows rapid reconfiguration of a system utilizing up to eight pieces of equipment. Board Dimensions 4.7" x 2.6"
ESD Surge Protection Provides minimum of 15KV for all serial lines.